People who do not have a good knowledge of WHMCS can easily use the dashboard. An option of customizing the entire dashboard is also available, hence making WHMCS user-friendly. Customers are able to raise tickets and register complaints, a huge benefit to your business that allows you to understand if your customers are satisfied or not. The WHMCS Bridge is a plugin integrating the entire WHMCS billing and support software in WordPress. Not only does that allow you to design it according to your needs, it also offers a consistent and seamless user experience to all your customers. When you use the plugin integration, you do not have to style your WHMCS installation as the plugin possesses a theme inheritance feature. This feature further ensures that your WHMCS installation feels and looks like your WordPress site. 1- S market connect: With the full support of WHMCS market connect, you can seamlessly and quickly resell products through WHMCS (via Word Press) using the WHMCS marketplace. 2- WHMCS friendly URL’S support: Instead of basic URLs, you can upgrade and support WHMCS to ‘Full Friendly Rewrite’. WHMCS can easily be integrated with WordPress by using the WHMCS Bridge plugin called iPlugin. 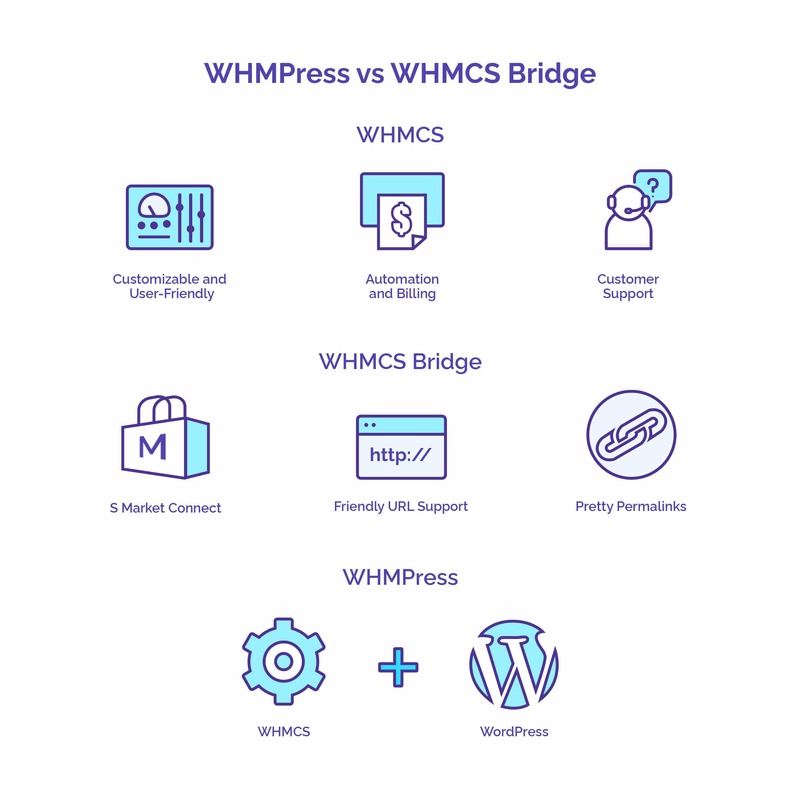 A freemium type of plugin, it will enable you to bridge your WHMCS to WordPress, opening doors to features like multi-lingual WHMCS support, single sign on and efficient support for WHMCS market connect. The initial step is to log into the existing WordPress Dashboard, install WHMCS plugin and get it activated in your WordPress. The next step is to move to plugin settings where you add your WHMCS URL before clicking save. When you get the WHMPress, you can get access to all primary integrations that will benefit you in web hosting. Alongside, you can get all premium WordPress plugins that provide efficient aid in creating and maintaining a hosting website. Considering the infinite amount of benefits of web hosting that you get with WHMCS, WHMPress can further add up to make the hosting experience even better. From designing the ideal web hosting page to modifying themes according to your requirements, both these integrations are a must for your web hosting venture. Previous Post What is Shared Hosting and Its Benefits?